The Short Term Investment Fund (STIF) is a diversified fixed income fund designed to provide returns in excess of those available in money market funds. STIF is constructed for consistent, low volatility performance with an emphasis on high credit quality, low risk and liquidity. Following Friends Fiduciary’s socially responsible investment guidelines, STIF is invested in a manner consistent with Quaker values and testimonies. This fund is particularly well suited for a one to five year investment horizon (e.g. reserves or funds needed for capital projects) providing a good return with low volatility. The fund has a target allocation of 80% short term bonds and 20% money market for liquidity. The bond component is diversified across the principal sectors of the domestic fixed income market, primarily US Agencies, Corporates (A rated or better) and Mortgages. There is an emphasis on high credit quality, low risk and liquidity; however, as with any fixed income investment, fluctuations in interest rates can cause the value of the fund to decline in the short term. The minimum initial investment is $25,000 (less than $25,000 will be considered on a case-by-case basis) and the minimum withdrawal is $5,000. For more information or to invest in the Short Term Investment Fund, contact Friends Fiduciary at 215-241-7272 or info@friendsfiduciary.org. Short Term Investment Fund unit value is net of operating expenses; the Fund does not have scheduled distributions. Investment returns for periods exceeding 1 year are annualized. Investment performance is presented gross of fees and is inclusive of dividends and interest. Investment returns represent past performance and do not guarantee future results. Returns and principal values will fluctuate such that, upon redemption, units may be worth more or less than their original cost. Indices that comprise benchmarks are unmanaged and are inclusive of dividends and interest. Investors cannot invest directly in the indices. 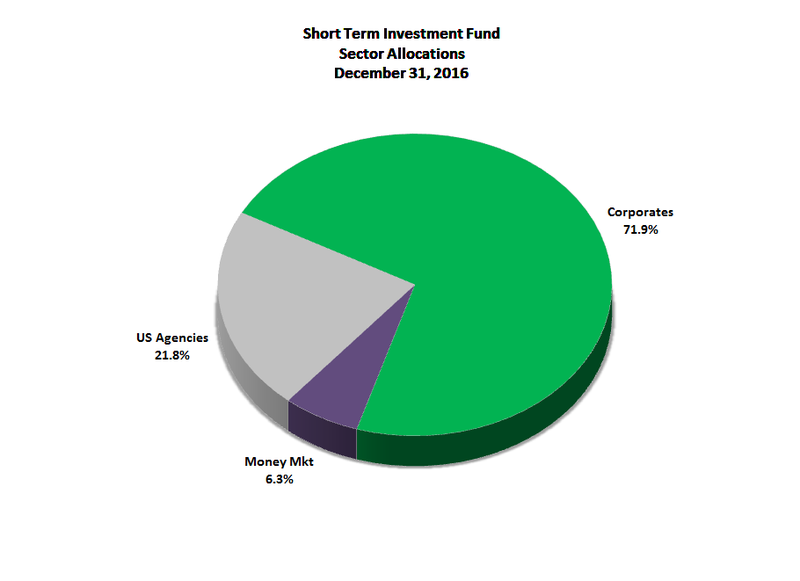 4Short Term Investment Fund Benchmark: 80% Bank of America Merrill Lynch US Treasury & Agency 1-3 Year, 20% Lipper Money Market Fund. Lipper Money Market Fund is an index of the 30 largest funds that invest in high quality financial instruments with dollar-weighted average maturities of less than 90 days. Fees: The Short Term Investment Fund currently operates with a flat annualized fee of 0.49% (49 basis points). The Short Term Investment Fund invests in high quality corporate and US Agency fixed income securities through an SEC registered, third-party advisory firm. The fund’s fixed income investments are subject to interest rate and credit risks. As interest rates rise, the value of fixed income investments will decline and may turn negative. Mortgage related securities tend to become more sensitive to interest rate changes as interest rates rise, increasing volatility. There is also the possibility that fund holdings may have their credit ratings downgraded or, in extreme cases, suffer a default. The investment manager who works in an advisory capacity may not deliver investment results as anticipated. Investors in the fund could experience a decrease in the principal value of their investment or go through a period of underperformance relative to the benchmark.